I’ve never liked seeing things go to waste. Especially when those things can be used again by someone else or redesigned for another purpose. It’s probably why I have a garage full of “junk” or as I like to call it “things that might come in handy one day.“ Now I’m just talking about small stuff, nuts, bolts, door latches and bits of timber, but lately I’ve seen a much bigger issue of waste that has been frustrating Tomahawk for more than three years. 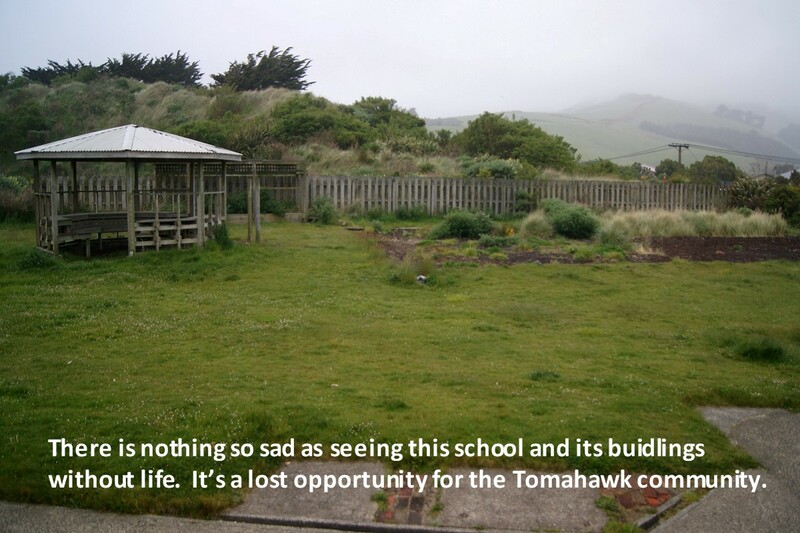 in 2012 the Dunedin City Council purchased the Tomahawk School site from the Ngai Tahu for $300,000. The school had been closed by the Ministry of Education in 2010 and the property sold by the Crown. The 2012 purchase by the Council was made as part of the Coastal Dune Reserves Management Plan process, creating a required level of protection for adjacent dunes. However, it appears that coastal protection was not the only reason for the purchase by the Council. It would be fair to say that those reasons have become considerably muddled. On one hand there is the thought that the land and school are a community asset. While on the other there was a view within Council that it was essential to buy the property to stop subdivision and consequent residential development on coastal land into 15 properties with 15 houses. During the last 3 years and the years leading up to the purchase, the community have expressed an interest in using the school building for a community centre and possibly restoring the old pool. 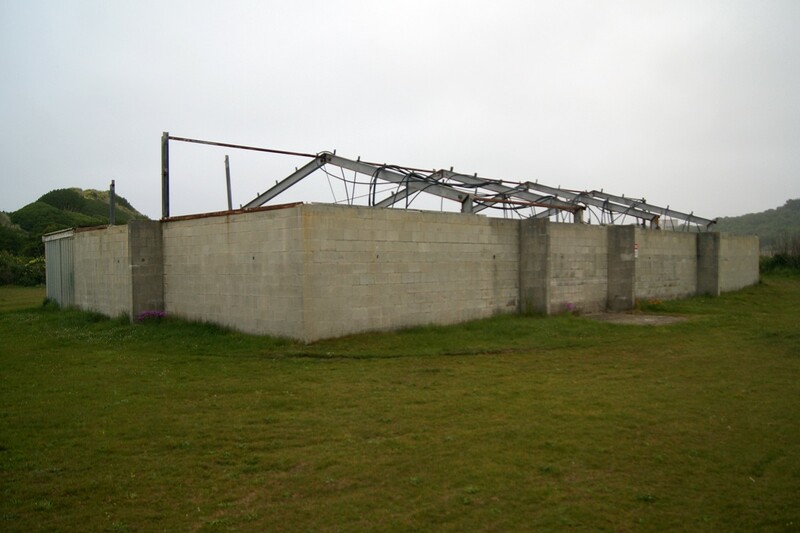 The pool building is now a wreck with repeated vandalism and damage to the roof by high winds. However, despite attempts, including from the Community Board to get this process underway there have been constant delays and effectively little or no further dialogue on the matter. Meanwhile, the buildings have been boarded over and the community locked out of them. I took the opportunity to visit the Tomahawk School site recently to satisfy my own curiosity and while I was there I met with a member of the community. The buildings are boarded up, however one of the side doors was open and with a pocket torch I took the opportunity to have a look inside. The main area of the school was warm and dry and I was surprised at the good condition of this area of the building and its carpeting. The eastern side of toilets and administration rooms has a flat roof and there is water damage in this area that has left the floor wet and the pinex ceilings collapsed in places. What struck me about the school site is what a great facility it is for the community and what a positive contribution it and its grounds make in the area. At the time of purchase it was quoted in the Otago Daily Times that “the property was a community asset, one residents were most positive about” and that it “means a lot to the local Tomahawk community.” Both quotes from that report are quite right but given the delays and the degradation of the buildings the City Council are letting the community down badly. 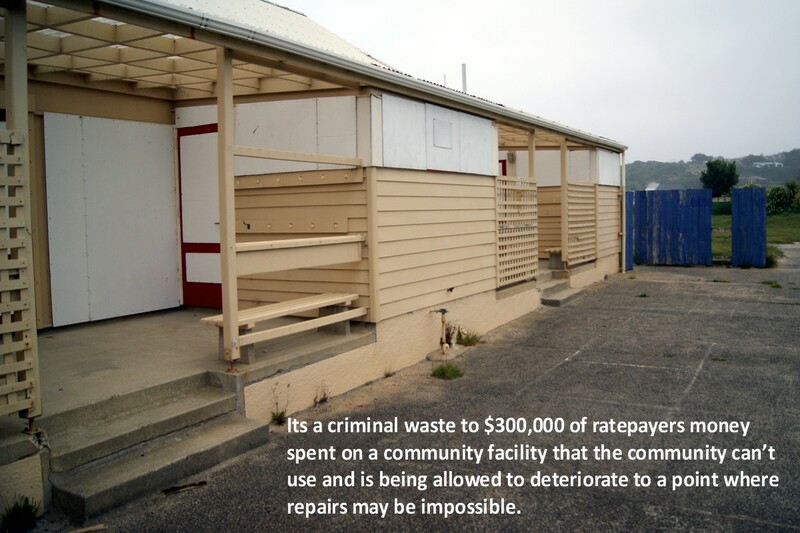 Its worse when you consider the wasteful use of ratepayers money and the likelihood that the community may not have the resources to bring it back from the brink. This is why I hate waste, because it’s so unnecessary, inefficient and it robs our community of opportunity in places like Tomahawk and other community’s. Just when will the City Council protect its $300,00 ratepayer investment is something that needs answering. This entry was posted in Dunedin, Local Issues, Otago Peninsula Community Board, Paul Pope, Tomahawk and tagged Community Aspirations, Community Facility, Dunedin, Dunedin City Council, Ocean Grove, Old School Building, Paul Pope, Tomahawk, Tomahawk Community, Tomahawk School, Waste Not Want Not on November 20, 2015 by Paul on the Peninsula. Agree entirely. It needs funding to upgrade it to a community centre. It makes sense to use it. I found your article about the school very interesting. I went to this school as my first school when I was 5 that’s nearly 25 years ago. I cannot believe what it looks like now. It makes me sad as this is not the image I remember and it’s not any memories of how wonderful it was. I am returning to NZ this new year and it leaves me feeling sad that I won’t return to this memory as I was wanting to see this. I cannot believe they have let a piece of history be wasted and destroyed when they could have used this space and these buildings for a better cause. They could have created this space for families in need. It is very sad to see the buildings that have such potential deteriorate in this manner. So many people have told me about their memories of the school like yours and this is why it would be great to see the community be able to use the buildings to grow that community spirit again. If said community had supported in the first place, the school would NEVER have closed, but it has. Now it doesn’t take a genius to work out that after being told the council could not store sand in what once was the old sewage works, just where do you think they plan to put it? Once the sad debilitating buildings that were once an awesome wee country school get to the state that Council deems no worth fixing, Oh gosh… yes they will demolish them! Then they will have a really big place to store sand or do what ever they like, including on-selling it as there are no buildings left for supporting locals to try and clam … to little to late. Now live with it !!! Its an interesting issue given the land was bought for dune conservation, but why buy a building and raise the expectations of the community? It’d be sad to see your scenario come true. I attended this school in my school years. this school is by far the the best part of my school years. It is outrageous that they have just let it turn to this state. the council really need to pull finger and need to do it soon. By leaving to community they will look after it and treat it the way it should be, it is the hart of the community, DONT WASTE SUCH A GOOD ASSET. I’ve had so many comments from people that attended the school and have good memories of it that it follows that the school should become a facility for the community. The City Council really need to get on with ensuring the building is suitable and not allowed to fall down. Well and then there’s the group who wants the DCC to buy Sammy’s, Chicks and god knows what else….. well this shows they can’t even look after what they already own on the ratepayers behalf…. Answers need to be gotten. … maybe the council could give them on Monday first thing lol. Thanks Liz, you’ve hit the nail right on the head, why would you buy something, raise the expectations of the community and then let the thing fail because you can’t look after it properly. I’m going to keep working on finding out what can be done. Aside. I haven’t met any group that is suggesting DCC buys Sammy’s or Chicks. A fabrication?Commercial ownership is the only solution for their adaptive re-use and long term stewardship in the community.